The body of scientific studies linking gut health and mental health is growing at a rapid pace. There are now over 450 million people globally suffering from some form of mental illness. Most are treated with pharmaceutical drugs and therapy. But drugs and therapy aren't the only answer. 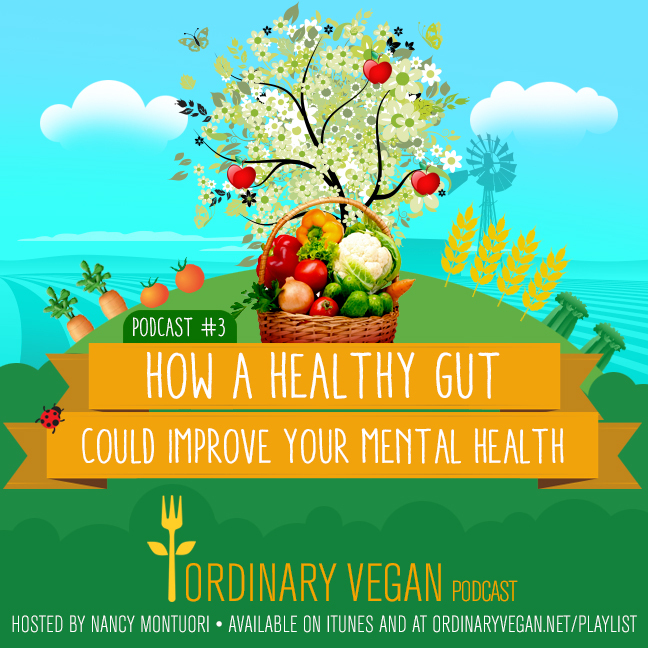 Gut health can be your first line of defense against mental illness. In today's podcast episode, we explore the connection between diet and common types of mental health problems. Discover which foods you should be eating and which foods you should avoid for gut health. A healthy gut is not only critical to our mental health; but is also critical to our entire well being. In this week's podcast, we also discuss the importance of vitamin B-12 for your health and how to get sufficient amounts of B12 on a plant-based diet. Here is a link for this week's podcast plant-based recipe called Cauliflower Fried Rice. A perfect recipe to improve gut health. Thanks for joining us for this week's podcast on gut health. If you don't want to miss any of Ordinary Vegan's free recipes and podcasts, please sign up here. If you would like to subscribe to this podcast on iTunes, here is the link. The Ordinary Vegan podcast is also available on-demand at sites like Stitcher, which provides instant online streaming to Android, iPhone and Blackberry users. You can get the free app here. If you have never listened to a podcast before, click on this link to learn how. If you would like to be part of Ordinary Vegan's podcast, record a message or question here. Wishing you a peaceful and compassionate week! Hi Malie – Thank you for your kind words and taking the time out to let me know. They mean a lot to me. Sending you lots of peace and compassion for the holidays! And thanks for being part of our healthy community!